I am so glad to be getting back into a crafty groove!! I feel a bit lost when I don't color for more than a week. So I had to print and redo several of my pieces this week!! :( It's alright though, it will all come back fairly soon. From the Heart is back from break and the new weekly sketch is up. Love this image and those little mice are TOO cute!!! I colored my image with my Copics. The patterned paper is from: Echo Park: This and That Christmas and the ribbon is from PTI. I kept the card fairly simple and clean. Here's a look at this weeks sketch. I hope that you will join us!! A little reminder that the Stamp of the Month image, is being given away to everyone, so that you can play along and get next months image free. Come by and check out what the rest of the team has created for you this week. What a sweet image! Love your card...happy you're back! LOVE that newsprint...so cute and clever! Love the background on this card, Calypso…your coloring is marvelous too! This is a great take on the sketch!! Thanks for sharing at Craftin Desert Diva's Winter Linky Party!! Love your card. Great layering of printed papers too. Nazeema, you are the Queen of coloring!!! Another excellent job here! And I like that sketch, too!!! What a fantastic card Nazeema, I love all those layers and this image is so cute. Thank you for joining us for Merry Monday. I am partial to a beautifully colored image and this is it! You've done a fantastic job with this cute digi stamp (and thanks for the link to the shop - I need to pay a visit!). Thanks so much for joining us at Merry Monday. I love this image and you've colored it beautifully! I also love the pop of the green ribbon! Thanks for sharing this with us at Merry Monday! 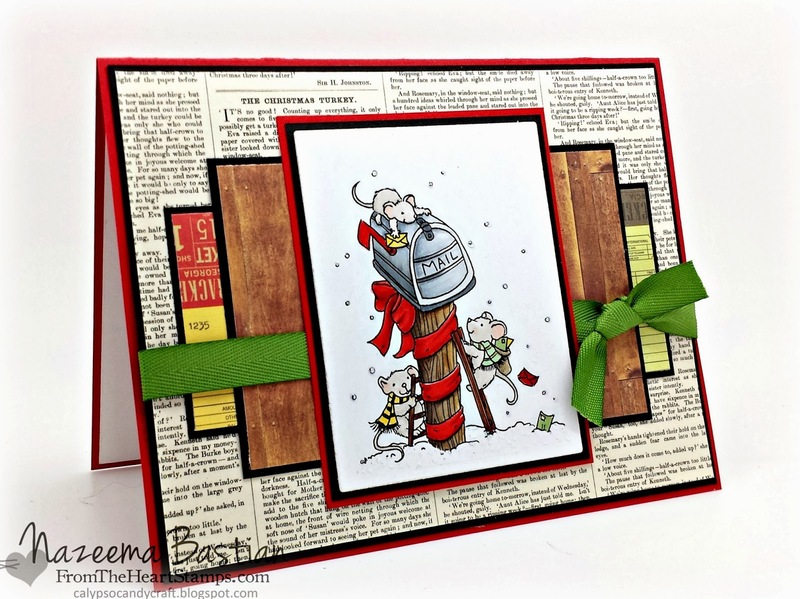 Great layering and coloring in this card! thanks for joining the Craft-Dee BowZ January challenge! I love the sketch you used and how you tucked the ribbon in-between the layers, clever! Thanks for joining us at Merry Monday! Love the cute stamp - with the colors and layering - it all make it fun to look at it"
great coloring on the cute card. Love this composition. love the mice!!! Thank you for linking up with us for Tara's linky party at Craftin Desert Diva's We hope that you will join us again for the next linky party! Adorable image, sweet card. Thanks for joining us at Merry Monday this week. Beautiful card! I love all the layers and the pop of green! Thanks for joining the Craft-Dee BowZ Challenge! Such a pretty card!!!! Love the colors and layout!!! Thanks for linking up with Craftin' Desert Divas!